Peer-Run support group. Come and meet other families that are affected by Autism and other special needs. We want to share ideas and experiences, vent about the brick walls we've hit, and most importantly realize that we are a growing community and that we are not alone. Our group is not exclusive to Grand Island residents! Anyone from the surrounding areas in both Niagara and Erie Counties (and beyond) is always MORE than welcome! Meets the first Tuesday of each month at the Howard Hannah real estate office basement, 2139 Grand Island Blvd. from 6:30 p.m. - 8:30 p.m. 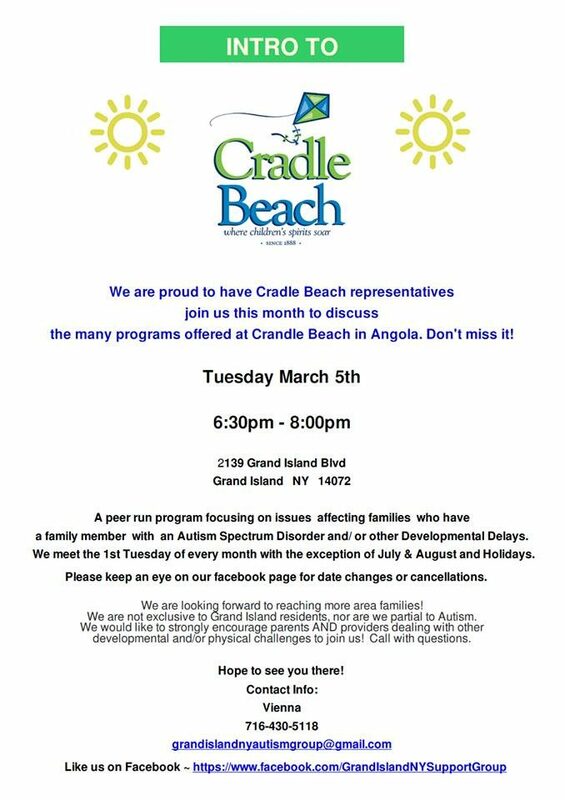 The Grand Island Autism Support Group is hosting an "Intro to Cradle Beach" on Tuesday, March 5th from 6:30 p.m. - 8:00 p.m. at the Howard Hanna office, 2139 Grand Island Blvd. Representatives will be there discussing the many programs offered at the camp in Angola. Come and meet other families that are affected by Autism and other special needs. Meets the first Tuesday of each month at the Howard Hannah real estate office basement, 2139 Grand Island Blvd. from 6:30 p.m. - 8:30 p.m. Contact person: Vienna Haak, 430-5118. 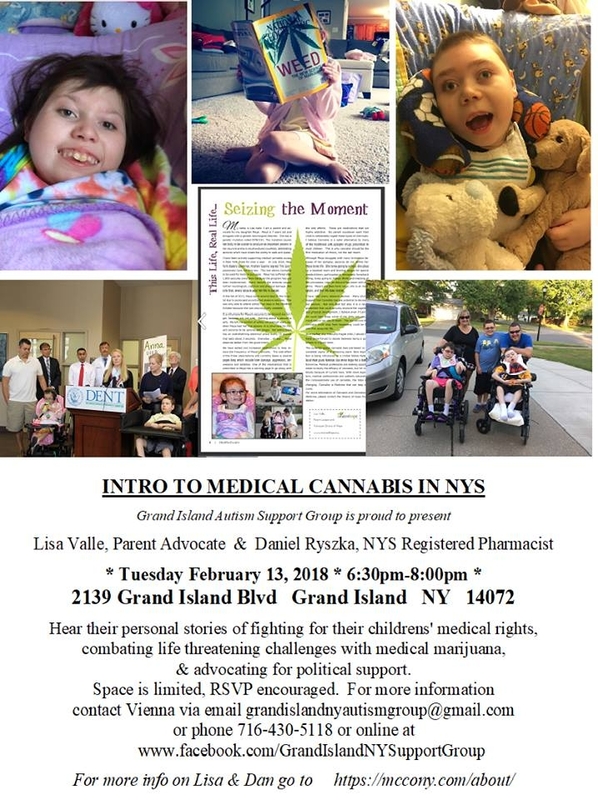 The Grand Island Autism Support Group is hosting an "Intro to Medical Cannabis in NYS" on Tuesday, February 13, 2018 at 2139 Grand Island Blvd. (Howard Hanna office), from 6:30 p.m. - 8:00 p.m. Space is limited and RSVP encouraged. See	flyer for details. Please Join Us! The Next Grand Island Autism Support Group Meeting is Tuesday, October 3rd from 6:30 p.m. - 8:00 p.m. at the Howard Hanna Office, 2139 Grand Island Blvd, Grand Island NY 14072. This month's special guest is Alyssa Bennett, FSS Intensive Respite Program Coordinator. See flyer for more details. Brick Oven Pizzeria & Pub will host Breakfast for Autism Awareness at 8:00 a.m. on Sunday, April 23 & 30, to raise money for Autism Awareness Month. See	flyer for details. Please Join Us! The Next Grand Island Autism Support Group Meeting is Tuesday March 7th from 6:30 p.m. - 8:00 p.m. at the RealtyUSA Office, 2139 Grand Island Blvd, Grand Island NY 14072. SPECIAL GUESTS: BONNIE & KATHY from Unique Design in Lancaster will be here to introduce us to their AUSOME unique products. They proudly make custom weighted blankets, lap pads, scarves and vests. The owner has over 20 years experience sewing custom compression garments and is excited to start serving the Autism and special needs community! See flyer for more details. The Grand Island Autism Support Group meets the 1st Tuesday of every month at 2139 Grand Island Blvd. from 6:30 p.m. - 8:00 p.m. The May meeting is Tuesday, May 3rd. This is a peer run program that focuses on issues affecting families with Autism or other Developmental Delays, see flyer for more details. The Grand Island Autism Support Group meets the 1st Tuesday of every month at 2139 Grand Island Blvd. from 6:30 p.m. - 8:00 p.m. The April meeting is Tuesday, April 5th. This is a peer run program that focuses on issues affecting families with Autism or other Developmental Delays, see flyer for more details. The Grand Island Autism Support Group meets the 1st Tuesday of every month at 2139 Grand Island Blvd. from 6:30 p.m. - 8:00 p.m. The February meeting is Tuesday, February 3rd. This is a peer run program that focuses on issues affecting families with Autism or other Developmental Delays, see flyer for more details. The Grand Island Autism Support Group meets the 1st Tuesday of every month at 2139 Grand Island Blvd. from 6:30 p.m. - 8:00 p.m. The December meeting is Tuesday, December 2nd. This is a peer run program that focuses on issues affecting families with Autism or other Developmental Delays, see flyer for more details. The Grand Island Autism Support Group meets the 1st Tuesday of every month at 2139 Grand Island Blvd. from 6:30 p.m. - 8:00 p.m. The October meeting is Tuesday, October 7th. This is a peer run program that focuses on issues affecting families with Autism or other Developmental Delays, see flyer for more details. The Grand Island Autism Support Group meets the 1st Tuesday of every month (except this month) at 2139 Grand Island Blvd. from 6:30 p.m. - 8:00 p.m. The September meeting is Tuesday, September 9th. This is a peer run program that focuses on issues affecting families with Autism or other Developmental Delays, see flyer for more details. The Grand Island Autism Support Group will meet on Tuesday, March 4, 2014, at 2139 Grand Island Blvd., (Realty USA office) from 6:30 - 8:00 p.m. We are looking forward to reaching more area families in 2014! 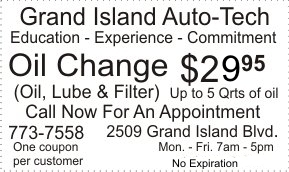 We are not exclusive to Grand Island residents, nor are we partial to Autism. We would like to strongly encourage parents AND providers dealing with other developmental and/or physical challenges to join us! This is a free event! RSVP appreciated, but not required. 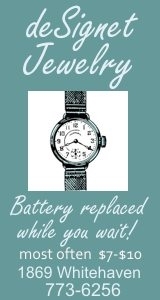 Call / Text Vienna Haak at 716-430-5118 or email vahaak@yahoo.com. The Grand Island Autism Support Group will meet on Tuesday, February 4, 2014, at 2139 Grand Island Blvd., (Realty USA office) from 6:30 - 8:00 p.m. See flyer for details. This is a free event! RSVP appreciated, but not required. 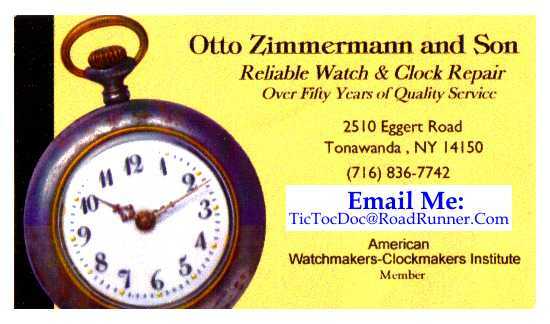 Call / Text Vienna Haak at 716-430-5118 or email vahaak@yahoo.com.